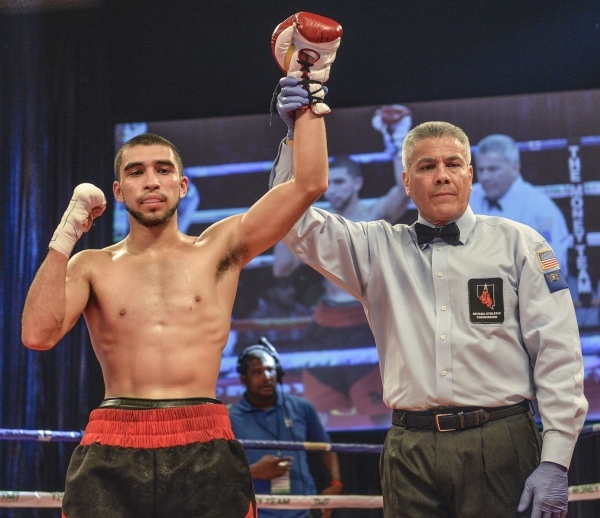 Super featherweight prospect Xavier Martinez (13-0) is very excited for his upcoming bout against John Moralde (21-2). The fight will be a step up for the Mayweather Promotions’ prospect and will headline the April 5th edition of ShoBox on Showtime. The Sacramento, Calif. based fighter is well known in Las Vegas, having fought several times at Sam’s Town Hotel and Gambling Hall, the venue where this fight card takes place. He plans on using this televised platform to introduce himself to the rest of the boxing public. “This training camp has gone real great. I feel like I am ready to go tomorrow. I have been training real hard for this and I feel like this is my moment to show everyone who Xavier Martinez is,” said Martinez. The 21-year-old has fought on television before but not as one of the featured bouts on a card. He is putting a lot of pressure on himself to not only win but to perform at a high level. “I was real excited (when I heard the news). This will be my third time fighting on tv but this is a bigger platform. I feel like I gotta shine and be at my best,” he explained. For a young fighter, Martinez hasn’t been very active. He only fought twice last year and three times in 2017. He expects that to change in 2019, having already fought once in February and expects to have a very big year. “I think this year I will be a lot more busy and not having so much time in between fights is going to benefit me a lot. I should get off to a faster start. I won’t be taking my time as much. For this fight I want to get right into it. I don’t want to play around and if I can get him out early then I want to get him out early,” Martinez stated. His opponent is a very experienced fighter and just last year scored a big upset win when defeated the previously unbeaten Ismael Muwendo. His two losses have also came against top opposition. With on April 5th, Martinez said the plan is to step up his level of competition again as he progresses towards his goal of fighting for a world championship. “I want to hopefully get right back in the ring two or three months from then against better competition and hopefully by the beginning of next year get a title shot,” Martinez told BoxingScene.com.